Chinese skullcap (Scutellaria baicalensis) is an herb commonly used in traditional Chinese medicine. A member of the mint family, skullcap is rich in nutrients including antioxidants known as flavones that reduce the effects of oxidative stress on various tissues in the body. In particular, Chinese skullcap contains baicalin and baicalein, two compounds that have been studied for a wide range of healing properties. In a 2008 study on mice, scientists discovered that oroxylin A (an antioxidant found in the roots of skullcap) may help protect against memory impairment induced by amyloid beta, a substance that forms the brain plaques associated with Alzheimer's disease. Compounds found in skullcap may help slow the growth of prostate cancer tumors, suggests a 2005 study on mice. Skullcap was a constituent of the herbal formula PC-SPES, a dietary supplement that was taken off the market because some batches were found to contain prescription medications. Although a number of laboratory and animal studies showed that PC-SPES may thwart the growth of prostate cancer cells, it's not known if those anticancer effects were due to the action of the herbs or the prescription medications. A 2019 study on rats found Chinese skullcap can inhibit the development of benign prostatic hyperplasia (BPH) by suppressing abnormal androgen and relieving inflammation. More research is needed before recommending skullcap in humans. Published in 2008, a study on mice found that baicalein (another skullcap-derived antioxidant) may help protect nerve cells from damage associated with Parkinson's disease (a chronic condition that causes tremor, stiffness of the limbs and trunk, impaired balance and coordination, and slowing of movement). Chinese skullcap is believed to be safe and well tolerated by adults. Side effects are few and may include drowsiness. People with diabetes should not take Chinese skullcap without consulting a doctor as it may lower blood sugar, increasing the risk of hypoglycemia. Skullcap should not be used during pregnancy or breastfeeding. Skullcap is available as capsules, tea, extract, and tincture. There is no recommended daily allowance for skullcap and there is not enough scientific evidence to determine an appropriate range of doses at this time. Chinese skullcap is often combined with other herbs into a preparation. Follow dosing recommendations on the label. There are two varieties of skullcap on the market, Chinese skullcap (Scutellaria baicalensis) and American skullcap (Scutellaria lateriflora). These are different plants with different purported benefit. Look for Chinese skullcap, which was studied in the research reported above. What does skullcap tea taste like? 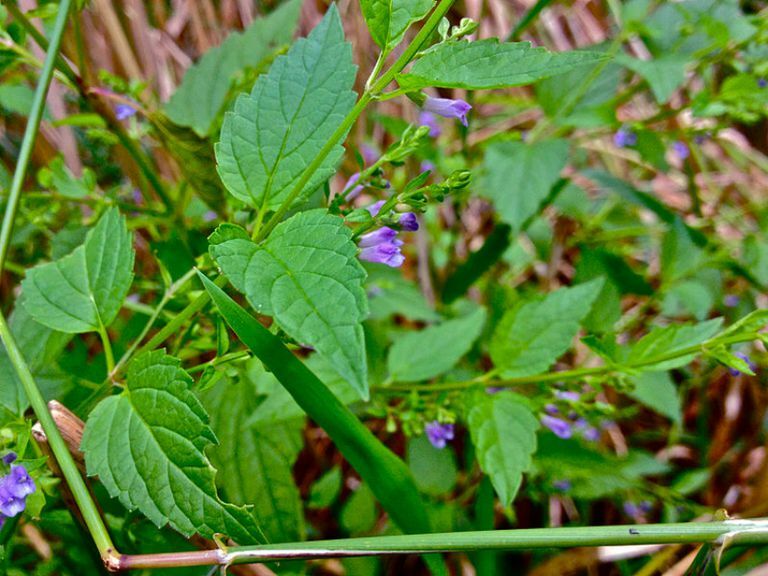 Although skullcap is a member of the mint family, it does not have a minty taste. Skullcap has a bitter, earthy taste. Many people use sweeteners with it to make it more palatable. Due to the limited research, it's too soon to recommend skullcap as a treatment for any condition. It's also important to note that self-treating a condition and avoiding or delaying standard care may have serious consequences. If you're considering using skullcap for any health purpose, make sure to consult your physician first. Brock C, Whitehouse J, Tewfik I, Towell T. American Skullcap (Scutellaria lateriflora): a randomised, double-blind placebo-controlled crossover study of its effects on mood in healthy volunteers. Phytother Res. 2014;28(5):692-8. doi: 10.1002/ptr.5044. Jin BR, Chung KS, Kim HJ, An HJ. Chinese Skullcap (Scutellaria baicalensis Georgi) inhibits inflammation and proliferation on benign prostatic hyperplasia in rats. J Ethnopharmacol. 2019;235:481-488. doi: 10.1016/j.jep.2019.01.039. DMAE: Are There Benefits for Your Brain and Skin?